As Spearos we know that there are inherent dangers that come with our beloved sport. We have to look out for the Taxman, Johnnies or whatever nickname it is that you call Sharks by. We have to make sure not to dive beyond our depths, watch out for SWBs and Sambas. Keep an eye out for other dangerous critters and fish. Not getting tangled in our rigs and watch currents and drift distances. 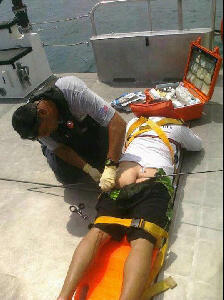 But there is another danger to look out for…That of your overeager spearfishing buddy. Please be careful out there, accidents don’t happen…they are caused.